Alabama Tornado Damage from Filmbox Studios on Vimeo. One week after a historical tornado outbreak in the Southeast and the people of my state have stepped up and banded together in ways that are just joyful-heart-bursting. 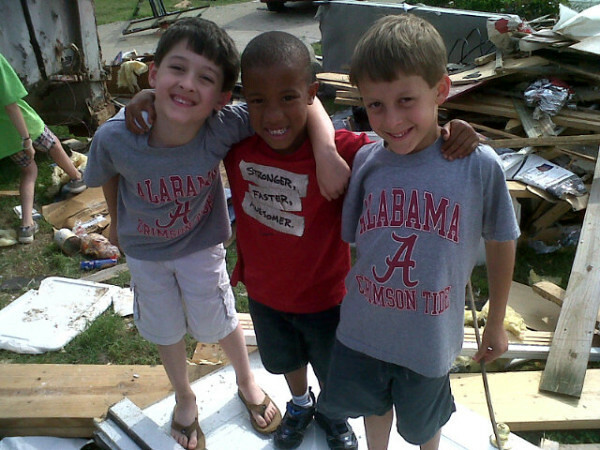 There was little doubt in my mind that Alabamians would rise up to help each other before the wind even quieted down. I’ve seen so many examples of the generosity over and over again in the past week. Facebook pages like Toomers for Tuscaloosa and others have been thrown together on the fly to help connect people with urgent needs like water, food, and supplies. Others help connect people with their loved ones, their pets and their mementos. Twitter and facebook have been especially useful in helping spread the word instantly about food/water/supply urgent requirements of different communities. It’s not a fool-proof system, but at least it’s a system. My good friend Rachel posted about how social media is changing the way disaster response works. It’s been truly amazing to watch this past week unfold. People from across the nation have shown us so much generosity. I don’t even know where to begin to say thank you for all that I’ve witnessed. Last week my cousin Michael sent out an emergency email to his EMS squad and within 24 hours was able to fill an entire U-Haul trailer full of donations to bring down here from St. Louis, Missouri. He drove all night and arrived at 4 am with his wife, preschool son and Mother-in-law in tow just to help out with relief efforts near his hometown of Oak Grove. Tonight he was interviewed by the St. Louis Fox news affiliate for a heartwarming story about the storm relief effort. Thank you Cousin Michael and everyone on his team in St. Charles, MO for helping out! All this help, but still we’ve barely even begun to scratch the surface of the needs of this state. These tornadoes have been declared a Category 1 emergency, which is the same level as Hurricane Katrina and September 11th. 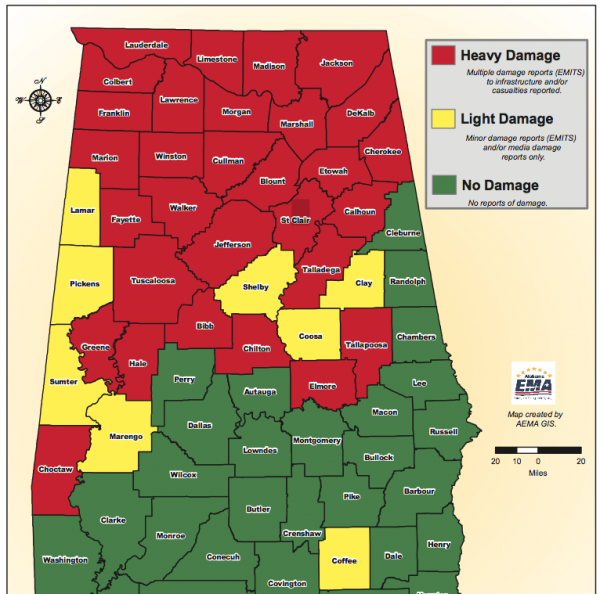 Take a look at this map and note the category rankings of the tornadoes that rolled across Alabama on Wednesday. F5 is as high as the scale goes. Two days ago I decided to set up an Amazon wishlist for some out-of-state friends who were asking what they could do to help. With a little help from facebook and twitter and my incredible online friends, the wishlist now has hundreds of items purchased and on their way to the Christian Service Mission in downtown Birmingham. 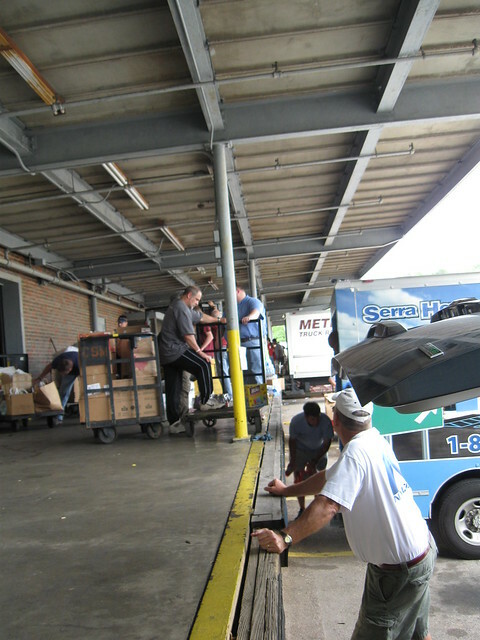 The tireless volunteers at the CMS are receiving your items by the UPS truckload already! Donations are pouring in from everywhere! Check out this photo I got today from someone at the mission. This was taken about 36 hours after the wishlist was created! Amazing. To everyone who has already donated, this is ALL YOU! Thank you. Just thank you. Here’s what happened after you clicked the “send” button on your amazon order. Once your items arrive at the CMS the boxes are sorted by volunteers, loaded on volunteer’s trucks and redistributed right back out into the affected areas. Last Saturday I made two of these delivery runs with my cousin, Jackie, and a friend, Michael. I’m going to try to put into words what all we saw along the way. I was too busy to snap photos except for this one of the loading dock at the Mission. All of those people? Volunteers. All of those trucks? Volunteered. **EDIT-Saturday May 7th update: Check out this INCREDIBLE 360 panorama view from inside the mission made by David Griner (@griner). This gives you a much clearer image of what is happening with all the donations that are coming in by the truckload and being sent right back out. We filled my husband’s truck slap full of donated baby food, diapers, hygiene items, food, drinks, snacks and clothes and set out to deliver them personally to a place that needed it the most. Michael followed behind me in his truck with a truckload of bottled water. I had no idea where we were going, but I decided it didn’t matter. Anywhere we went would appreciate these items and share them with people who could use them. With 18 counties affected in less than a 100 mile radius I could have thrown a rock and hit somebody who needed help. Not that I would throw a rock at someone who needed help… LOL but you get my point. After some deliberating I decided to go to Hackleburg since my friend Mandy was there helping her family salvage things from their homes that were destroyed. I headed up Hwy 78, but along the way I got a voicemail from Mandy. Turned out that there was a mandatory 3 pm curfew in that area so we wouldn’t make it in time. I was just passing by the Cordova exit on I-22 when I decided to go there instead since I’d heard on the radio the entire town had basically been wiped out. We found our way to Cordova High School past several National Guard checkpoints where FEMA had set up a command center and shelter for residents of this hard-hit small town. If you don’t read another link in this post, please take a minute to click on this one. This article about the relief efforts in Cordova this week sums up what I witnessed as soon as I pulled into the parking lot. That place was running like a well-oiled machine, and that was just three days after the storm hit! Imagine how efficient they are now! I tip my hat to everyone in that community for pulling together and finding peace and order out of what should have been total chaos. We pulled into the parking lot and a man directing traffic told us to go around the back of the school to the lunch room doors. We turned the corner of the building and were greeted by the smell of smokers and BBQ on huge grills. Crowds of people stood around laughing, talking, working and cooking food on the outside bbq pits. We were directed to the lunchroom door where five men immediately came to help us unload all of our items from the back of the truck. A young man was introduced to us and he told Michael to follow him with the water to a storage facility because they were running out of room at that location. Our truck of supplies was unloaded in minutes and taken inside the lunchroom. On the floor of the lunchroom all of the supplies had been separated out into orderly little groupings with rows in between so people could walk around and pick up what they needed. I saw an elderly woman wearing a torn t-shirt picking up ramen noodles and putting them into her basket along with a few other things. She looked as if she was debating about taking two packages, and finally she did. Two packages of ramen noodles, y’all. What’s that? Like $0.30 cents worth? Approximately? I hope she went back for even more after I left. I have tears in my eyes thinking about it right now. I can promise you that every little bit you give helps someone else in ways that you cannot even imagine. People are being fed, clothed, sheltered and loved by charitable people all across America and beyond but especially by their fellow Alabamians. If you can take a minute to look through the wish list and send something our way, we would be so incredibly grateful. I can promise you these items will go directly into the hands of the people who need it the most. Click here to view the Amazon Wish List. It would also be an honor if you could take a minute and share this link on your blog, share it on your facebook wall or tweet the link to your friends. I watch items being purchased off the list, and my heart just fills with joy at the overwhelming generosity of people around the world who are willing to help. According to the Jasper Daily Mountain Eagle the Federal Emergency Management Agency says people who need a place to stay after the deadly tornadoes in Alabama now have 20 shelters available. The shelters are supported by the American Red Cross. They are located at the Cullman Civic Center, Hanceville Recreation and Wellness Center, Ryan School in Joppa, Rainsville Civic Center, Carnes Recreation Center in Attalla, First Baptist Church in Russellville, Boutwell Auditorium in Birmingham, Pleasant Ridge Baptist Church in Bessemer, First Baptist Church in Dora, Moulton Armory, First Baptist Church Life Center in Athens, Good Shepherd United Methodist Church in Madison, First Baptist Church in Winfield, Albertville Recreation Center, Ashville Middle School, Belk Center Parks and Recreation Building in Tuscaloosa, the Tuscaloosa VA, Northside Baptist Church in Jasper, Hunters Chapel Holy Church of Christ in Jasper, and the Haleyville Fire Department. In addition to those 20 shelters set up around Alabama there are even more command centers such as the GiGi Hardin center in Brookwood where we delivered another load of supplies after going to Cordova. If you live close by any of the places affected and are looking for ways to physically help without having to get past the National Guard check points at the hardest hit areas, how about going down to the Christian Service Mission and loading up this weekend and delivering to some of these items? The rewards are great, the effort is little. The cost is a tank of gas. From the very bottom of my heart, thank you so much to everyone who has granted Alabamian’s wishes! And thank you, God, for blessing us in so many countless ways. This photo courtesy of twitter! Awesome, Beth!! Thank you SO much for having the idea to set up that wish list – what a difference it is making! The true light in this storm is seeing the hearts of the people of Alabama AND around the world – I’m blown away by the “Loving of our Neighbors” that is happening! This is great- sometimes we just need to hear specifically how we can help. 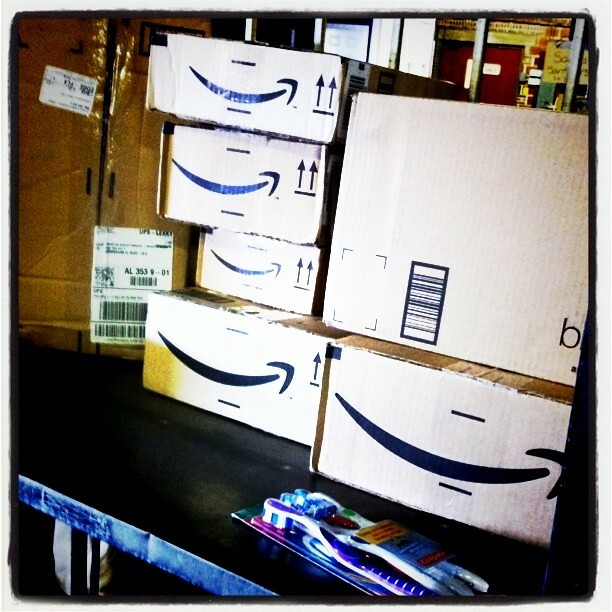 I’m sending wishlist items that relief efforts way, and will share it on my blog.